In this guide you'll find details explaining how to unlock your trustworthy Sparrow vehicle in Destiny 2, allowing you to travel through patrol areas at greater speed and save yourself a lot of time. The Sparrow ship is an elongated, hovering "motorbike" vehicle, with no weapons but decent speed and responsive controls. 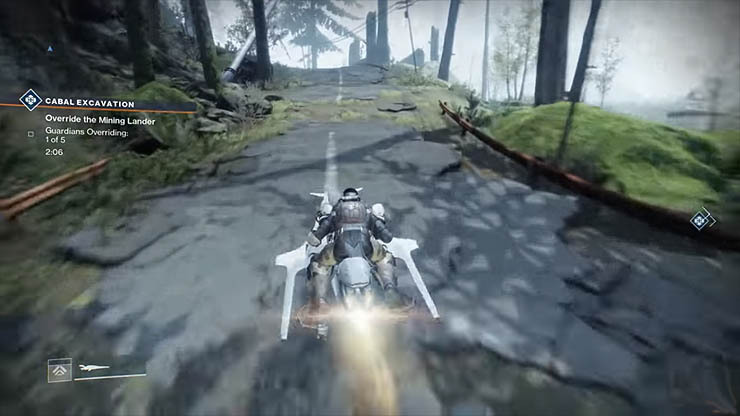 Fans of Destiny 1 will remember just how useful the Sparrow vehicle was in the original game, helping you traverse the vast sections of Patrol, long before Fast Travel points were a thing. Without that little vehicle it would have been extremely painful trying to get from Public Event to the next. They also came in dead handy during Strikes, allowing players to skip entire sections of a strike to speed run for engrams and other rewards. In Destiny 2 there's bad news I'm afraid. You will NOT get a Sparrow until you have finished the entire story. That's right, you're going to have to run everywhere until you complete the final mission, at which point the well known Amanda Holiday becomes unlocked, at a certain location that I'll keep secret to avoid spoilers. Once the story is done, simply visit the ship vendor and claim your reward; a choice of one of three Sparrows of the Common variety. They may not be fast but they're a million times better than walker! After this, select your Sparrow at any time during story missions, Strikes, Adventures, Lost Sectors or any patrol area and move around the planets of EDZ, Titan, Nessus and IO alot faster. 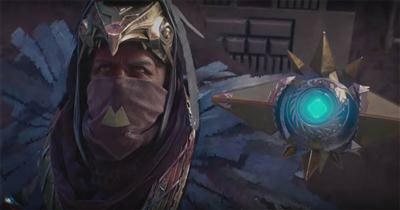 In addition to regular vehicles, Destiny 2 also includes Exotic Sparrows for the first time. These high level Sparrows are available via Bright Engrams which can be decrypted through Tess Everis, the farm vendor who sells aesthetic items. They have fancier designs and far superior speed and handling. 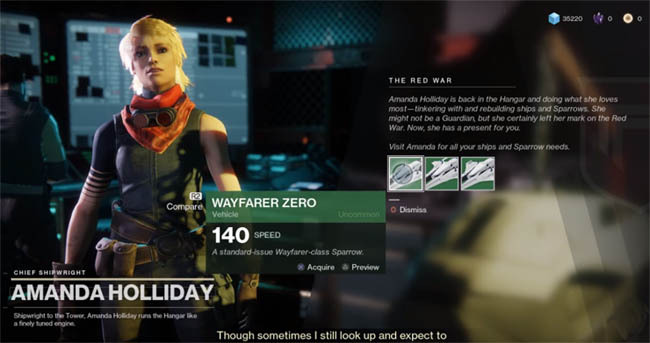 Like other items from Tess, players can earn Bright Engrams to exchange in return for one of her rewards, which can include anything from mods to ships and of course sparrows. She does not offer weapons or armour items, only aesthetic items. Eververse is the one place where microtransactions exist in the game and players can optionally choose to spend real money in exchange for Bright Engrams, increasing the chance of earning an Exotic Sparrow.